Turkish warplanes struck targets belonging to the Kurdistan Workers' Party (PKK) in northern Iraq on Monday, the military said. The strikes eliminated seven previously-identified targets. The Turkish military began hitting PKK camps in southeast Turkey and northern Iraq on July 24 after two police officers were found dead in the southeastern province of Şanlıurfa. The PKK claimed responsibility for the slayings, which were in reprisal for a suicide bombing which left more than 30 people dead in Suruç town. They called off a ceasefire that had held since 2013 and resumed attacks. As many as 35 Daesh targets were destroyed in the most recent joint strikes by Turkey and US-led coalition. 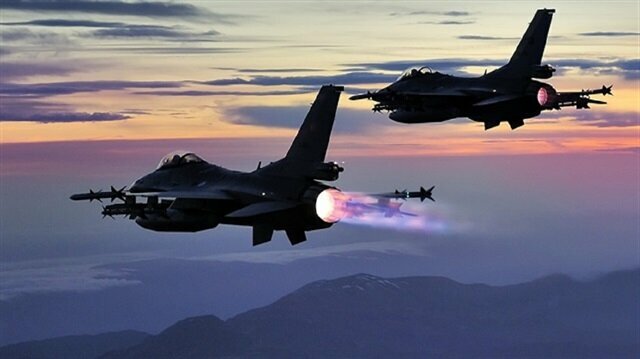 Turkish howitzer fire and nine coalition strikes also neutralized 19 terrorists as they were preparing to strike Turkey with Katyusha rockets and mortars from northern Syria. Since mid-January, Daesh rockets have been targeting Turkish towns and cities, bordering Syria, most significantly Kilis. A total of 21 people, including Syrians sheltering in Turkey, have been killed and more than 70 others wounded in these attacks.